Discover the landscapes of Uppland, a county full of wild and beautiful nature. In Biotopia’s theatre-like displays, kids and adults alike can enjoy seeing and hearing the wildlife of Uppland in an imitation of their natural environment. Students and other naturalists can read more about the species on display in our iPad databases (Swedish or English). On the lower level, you can see how long-extinct cephalopods swam, and learn how Uppland became the landscape you see today. And in the Biolab, hands-on experiences abound. On previous weekends and school holidays, we have done scientific experiments, checked out our own cells under a microscope, built wooden bird feeders, and made imprints of leaves and animal tracks. For our current theme and activities, please contact us. As you enter Biotopia, keep your eyes open for our theme displays, and stop by the reception desk to pick up an English guide to the exhibits. Have a look at the information displays on Uppland’s nature reserves. Ask at the reception desk about activities coming up in our calendar, and don’t forget to check out the museum shop – you’ll find books, games, puzzles, experiments, stuffed toys, useful gadgets, outdoor accessories, and much more. Looking for online information on Uppland’s nature? Check out Upplandsstiftelsens updated English page here! Please book group visits in advance. See ‘Groups’ heading below. The exhibits and café are accessible to wheelchair users. There is a handicap-accessible washroom located by the entrance as well as one on the lower level near the café. Parking can be found at Ekonomikum Kyrkogårdsgatan10, along Vasagatan, Rektorsgatan or Börjegatan. City bus routes 2 and 5 stop at Ekonomikum, located at the intersection between Luthagsesplanaden and Kyrkogårdsgatan. Several UL regional bus routes also stop here, check the UL website for details. Route 22 (stop: Kyrkogårdsgatan) and route 9 (stop: Luthagsesplanaden) stop about 500m from the museum. Biotopia opened its doors again in October 2007 after having undergone renovations. 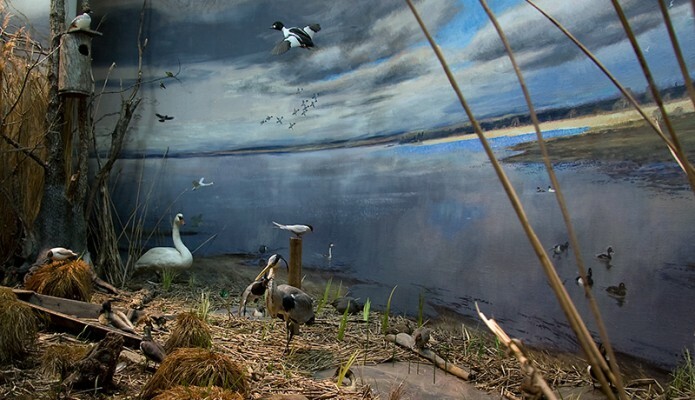 The old dioramas were preserved and renewed with new lighting and soundtracks. The focus of the new displays is the fauna of Uppland, as well as the changes the landscape has undergone through geological time. A dedicated lab and meeting hall was also built on the upper level, with facilities for individual experiments and group activities and workshops. The old Biological Museum dated from 1910. It was created by Gustav Kolthoff, a well-known naturalist of the day and curator of Uppsala University’s zoological institution. Kolthoff was an enthusiast of taxidermy, and was the creator of some of the world’s first nature dioramas. The turn of the century building which housed the old Biological Museum has been preserved, but a new entrance hall was added during renovations. Bird, Fish, or in Between (Fågel, fisk, eller mittemellan), the large glass design by Ulla Fries, is located on the east glass façade of the new entrance. Biotopia offers guided tours and school activities for all ages. Groups can also choose to explore the museum on their own. Please contact us to book your group visit. Daytime guided tours and activities are free for school groups within Uppsala Kommun and nature-related nonprofit associations. There is a fee for evening tours and group activities, as well as for non-school groups and school groups from outside Uppsala Kommun. Nature-related nonprofit associations have the opportunity to book the Biolab meeting space on Wednesday evenings, free of charge. For more information, please send us an email or call our reception desk. Biotopia’s species guide is now available in English. Find names, facts, and interesting links for each one, plus tips on great places to visit within the theme of each diorama, to help you make the most of your excursions in Uppland. You can listen to different bird songs and watch videos, and find out when and where a species was last observed within the county! Check out the iPads on Biotopia’s upper level, or access the guide from home by clicking here.